If an old film like ‘Hatari’ featuring John Wayne, Ben-Hur with Charlton Heston, ‘Fist Full of Dollars’ with Clint Eastwood or ‘Tora Tora Tora’ is shown again with the latest Dolby Atmos sounds, what would be the experience we derive? Though it is a tricky question to ask, it’s not unjust to opine above films of a golden era would embrace more cinematic quality if blend with this newest sound technology developed in the world for better entertainment purposes. Sri Lankan filmgoers now have the privilege of experiencing the magic in Dolby Atmos sounds at Scope Cinemas, at CCC. 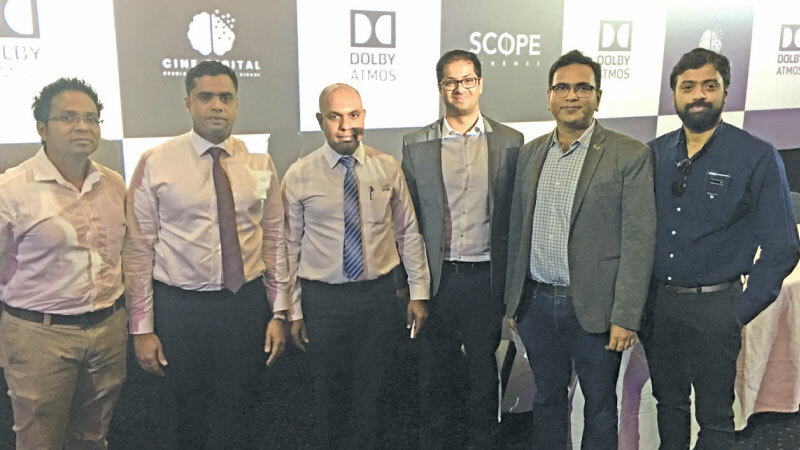 The newest Dolby Atmos screen unveiled on March 25 for movie enthusiasts at Scope Cinemas is the first cinema screen of this nature to be launched in Sri Lanka. Dolby Atmos technology advances the science of sight and sound to create and enable spectacular experiences. Before Dolby Atmos, cinema sound designers had to mix independent sounds together into channels to create soundtracks. A discrete sound such as a helicopter was assigned to an individual channel, rather than to where it would occur naturally in the particular scene. Although sounds could move across channels, there was no overhead dimension. Dolby Atmos screen offers sound to move above you to experience the real roaming of a helicopter above you or an alien emerging from the depths of the ocean. This award winning sound technology thus is known to offer an immersive audio experience for cinema-goers. It revolutionizes the experience of sound in entertainment, delivering a more natural and realistic sound-field, transporting people into the story with a lifelike, sensory experience. He added, “The launch of new screen marks a significant milestone for us. With Dolby Atmos, audiences at Scope Cinemas can expect to be transported into the breathtaking moving audio. This would be unique attraction for the audiences in Colombo. Moviegoers in other parts of the country too would soon be able to experience this cutting-edge audio at any Dolby Atmos screen near them”. Unlike traditional channel-based sound systems like 5.1, 7.1 and 11.1 that require filmmakers to think about the number and location of speakers, Dolby Atmos allows them to simply designate where in the cinema space each sound should be placed or moved to make an audience experience the film as if they were within its world. At the inception of world cinema, there was Silent Cinema that had films with no synchronized recorded sound. This early trend evolved towards the films with sounds. “Sound of early films came practically from just behind the screen. That was one channel of sound. What came next was the stereo sound which was the right and the left and we used to call it 2.1. Next revolution was the surround sound which was 5.1 offering surround effects with five channels. That was enhanced by 7.1. The newest sound technology, Dolby Atmos is not a channel-based sound technology but a technology that offers lifelike experience”, said Dolby laboratories senior director marketing, emerging markets, Ashim Mathur. Cine Digital, a system integrator has extended its expertise with installation of the sound system.